Collaboration, engagement, innovation, change and work in social systems is often achieved through magical conversations. Magical as they can be unintended, spontaneous, inspiring, off-the-wall, with whole systems, with others in groups or with oneself. Conversations are part of how we show up in our communities, organisations and the world, they are how we network and collaborate. People and organisations move in the direction of the images we hold of the future. Images of the future are created by the conversations we have, the stories we tell, and the things we study (if we study problems we create problems, if we study possibilities we create more possibilities). Images of the future are informed by the conversations we have and the stories we tell. …the questions we ask and the conversations we have are fateful (Adapted from the Encyclopaedia of Positive Questions, Cooperrider et al, 2002). This kind of inquiry opens doors to dialogue and discovery, it is an invitation to explore, be creative, challenge thinking and can lead to movement, action, ignite passion, engagement and change. As a People and Organisational Development Practitioner my role is to help individuals, teams and organisations inquire into themselves and their own experiences and potentially create change in their own reality, enabling them to move to a higher state of performance, identify and release potential. I believe through developing the capacity to interweave three levels of inquiry: 1st person (about me), 2nd person (about us) and 3rd person (about them), across different levels of experience and knowledge, through single-, double- and triple-loop learning, individuals, teams and organisations can deepen their inquiry enabling shifts and profound change to occur. From this perspective, my role as a People and Organisational Development practitioner is that of a qualitative researcher working alongside individuals, teams, and organisations as a co-inquirer.In practice I help the provide container for conversations that matter and inquiry that makes a difference, utilising knowledge, skill, relationships and relative independence to ask questions and to share perceptions (Schein, 2009). I am particularly interested in using conversation and inquiry to help people, teams and organisations have talk about how they talk together and about themselves, their teams and their organisations. Paying attention to what is represented in the language and metahphors we use and how our conversations can be the window to underpinning beliefs, assumptions and dynamics. Through this we can consider how our conversations can be improved, developed and used with authenticity and intention to do good work. Voicing – how comfortable are team members to express opinions and to challenge each other? Inquiry – how keen are they to understand the views of others? Productivity – how useful and productive are conversations? Power – what tight and focused are typical conversations? How much scope is there for flexibility? Structure – how tight and focused are typical conversations? How much scope is there for flexibility? 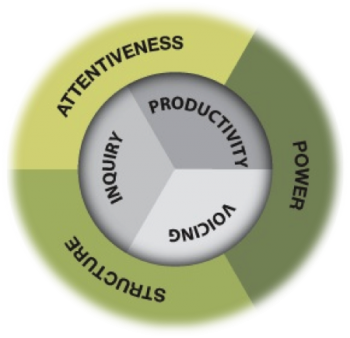 Attentiveness – how attentive and present are people in conversations? Presence: Maintaining undivided attention, really ‘being there’. Hyper-awareness: Acute self-awareness of biases, beliefs and emotional triggers. De-coding: Drawing out what the other person is really saying. Voicing: Speaking out with courage and conviction. 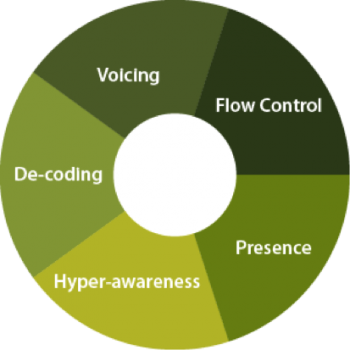 Flow Control: Managing conversations – the beginning, middle and end. Is the role of power and hierarchy in typical conversations? Great conversations are collaborative, innovative, planned, improvised and stuff happens as a result (whether intended or not). I can take conversation for granted and frameworks sometimes can help to prompt conversations about conversations, deeper inquiry, critical reflection, sense making and learning. I want to remain authentic, be more of myself and better. I act as a catalyst to help individuals, teams and organisations inquire, learn and develop.